For Somali Immigrants, All Politics Really Is Local : It's All Politics Minneapolis is home to the largest population of Somali Americans in the nation. Next week, they may see one of their own elected to the City Council for the first time. Members of the Somali community visit near a park in Minneapolis. The city is home to the nation's largest concentration of Somali Americans. Politics in Minneapolis is about to change. Not only is the city electing a new mayor on Nov. 5, it's also possible that a majority of the members of City Council will be freshmen. Among their number could be Abdi Warsame, who would be the first Somali American elected to the City Council there — or anywhere else. "The community has realized we can turn to each other to address issues of education, housing and health, which are mainly controlled by the politicians," says Mohamud Noor, a Warsame ally. As Noor points out, previous immigrant groups have also turned to politics as a means of gaining representation and improving their status. It happened a century ago with the Irish and the Italians in the Northeast, and far more recently in the Southwest and elsewhere with Hispanics. And now it's happening in Minneapolis, home to the nation's largest Somali community. "This is a process we've seen over and over again in American cities," says Daniel Hopkins, a political scientist at Georgetown University. "Once immigrant communities reach political mass, they start to engage in local politics." Tens of thousands of Somalis came to the U.S. as refugees in the 1990s, the result of chaos in their country that is widely remembered by Americans for the 1993 "Black Hawk Down" incident in which 18 soldiers were killed. Somalis were brought over by the State Department, but their settlement was generally arranged by nonprofit groups. That's why many ended up clustered in places such as Columbus, Ohio; Lewiston, Maine; and Minneapolis. "They came over as political refugees and came with nothing," says state Sen. Jeff Hayden, who represents parts of Minneapolis. "They literally showed up with sandals and linens on, walking into the cold in Minnesota." But the availability of jobs, housing and public transportation helped make the Twin Cities a good fit for the newcomers. Minneapolis, in fact, turned out to be much more hospitable than places such as Lewiston and Clarkston, Ga., where Somalis have run into open hostility from local politicians or other minority groups. 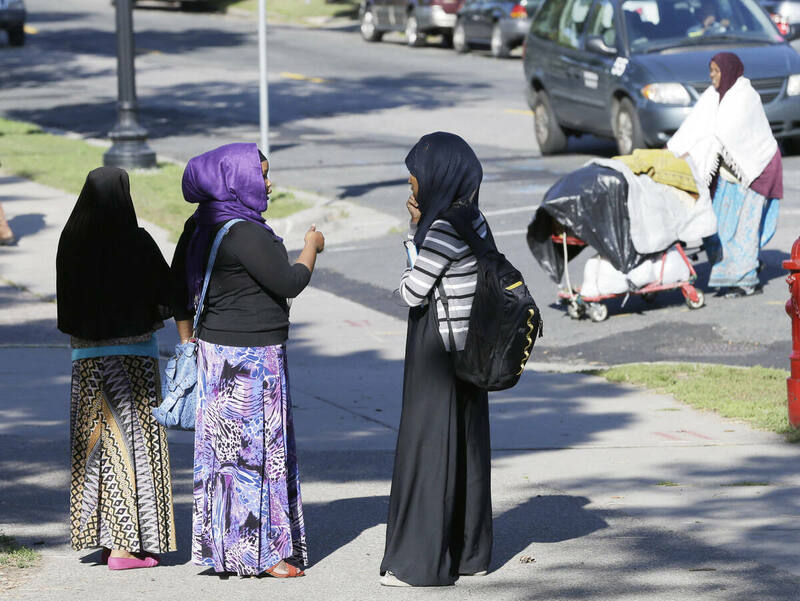 Many Somalis who were not settled in Minneapolis originally have since moved there on their own, says Ryan Allen, a public affairs professor at the University of Minnesota who has studied the community. "We've witnessed strong migration to Minneapolis that was based on word of mouth and family ties," he says. "It's undeniable that the Twin Cities are a major hub in the Somali diaspora worldwide." In 2010, a onetime refugee named Hussein Samatar was elected to the Minneapolis school board, becoming the first Somali American to hold elective office in the state. He died from leukemia in August, but he had already helped sow the seeds of political involvement. In 2011, Mohamud Noor narrowly lost a special state Senate primary, thoroughly dominating the vote in the heavily Somali Cedar-Riverside neighborhood. That neighborhood is home to Riverside Plaza, the largest housing complex in the state. The majority of its 6,000 residents are Somali — and the head of the tenants association is Abdi Warsame. Warsame also took advantage of one of the oldest tricks in the American political playbook: He played a role in the most recent municipal redistricting, helping to carve out a ward that is 42 percent Somali in part by making common cause with Hispanics who were also seeking their first representation on the City Council. "People knew they were getting a political base," says Hayden, the state senator. "As the city was starting to do their redistricting, part of the thinking was that it was time to draw lines in ways that were equitable but gave the Somali community an opportunity to win." Somali Americans vote. Perhaps it's because they especially appreciate the opportunity to participate in a democracy when their homeland has lacked a functioning government for decades. Or maybe, like earlier immigrant groups, Somalis excel at machine-style politics. Regardless, their turnout rate often tops 80 percent. "In both 2008 and 2012, the Obama campaign hired Somali-specific organizers because there was such a concentrated number of Somali voters," says Greg Schultz, who directed President Obama's campaign in Ohio last year. "It was certainly worth the campaign's focus." Schultz points out that, although it's a cliche, many taxi drivers are in fact Somali, so the sizable community in Columbus was able to organize its own ride to the polls. That's happening again right now in Minneapolis. The timing of the City Council elections means that some Muslims will not return in time from making the hajj, the religious pilgrimage to Mecca. Somalis have therefore been streaming to City Hall to cast absentee ballots. Warsame may have already banked a lead. More than 1,500 people have already voted, predominantly Somalis who have been shuttled in groups from Ward 6 by the Warsame campaign since September. "We don't sit down and wait until Election Day," Noor says. "Even at that moment, we don't just door knock. We drag the person to vote."